Martindale-Hubbell compiled the list from its comprehensive database of 254,000 law firms in the United States. 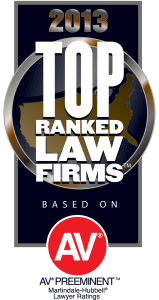 It selected firms of ten or more attorneys, where at least one of every three lawyers has achieved the AV Preeminent Peer Review Rating. This rating indicates that the rated lawyer has been reviewed by other lawyers and members of the judiciary and has been recognized as having demonstrated the highest ethical standards and legal ability. Shumaker Williams, P.C. is a premier business focused law firm offering a wide range of legal services for a variety of businesses, banks, mortgage companies, non-profit organizations and individuals. Our full service business law practice has been representing clients throughout Pennsylvania, Maryland, New Jersey, New York and Washington D.C. for 50 years. Our practice areas have evolved over the years to service the constantly changing needs of our clients. The firm’s areas of expertise include: corporate law; banking and financial services; litigation, arbitration and mediation; trial and appellate advocacy; business law and entity formation; business tax and ERISA consulting; hospitality and liquor license issues; commercial and residential real estate; trade associations; employment and human resources and intellectual property.